We discussed the courses for the 2019 season. We agreed to re-visit the regular courses Rudding Park, KP & Forest Park. We had a suggestion to improve the nearest the pins comp from Dave Webster where we give points for a nearest the pin and a point for hitting the green, then the player with the highest number of points wins a prize. This should add some more interest into the rounds we play. Anyone who hits a par 3 green in one shot needs to put their name down on the nearest the pin marker. All the par 3's in the five summer tournaments and Xmas texas scramble will count for this competition and the winner will be presented with the £50 on the presentation night. As this is a new competition we need a comedy name for it, so get your thinking caps on and get a piss taking name thought up. It doesn't have to be about Nige but think it will end up being about him. Pop your suggestions into the form below. Due to lack of funds we have cancelled the £20 combined score prize for each of the five rounds. To try and save some money, Graham Smith will be donating some Titleist golf balls for the 2019 season's nearest the pin and longest drive competitions. This will save us around £150. Cheers Graham. We have agreed the dates and courses for the 2018 season. Darren has booked the courses. Text, E-Mail, Facebook and Twitter messages have gone out. The fixtures have also been put on the notice board at Heppy's. We have decided to rename the Christmas Texas Scramble the Ray Jessney Memorial Trophy as a mark of respect to Ray's passing. Ray won the trophy three times. Steve will get the trophy re-engraved with the new trophy name and previous winners. We will play the You Know You Want It Matchplay Trophy in 2018. We are looking for sixteen players and people can see the home page for how to pay their £10 entry fee. Matches in the You Know You Want It Matchplay Trophy will now be played at 3/4 the difference between the two opponents handicaps rather than the full handicap difference. When we make the draw this year I will publish on the matchplay web page how many shots are to be given. A new supplier has been found and eight dozen Srixon Soft Feel logo golf balls have been purchased for the 2018 season nearest the pin and longest drive competitions. To encourage two players who don't play regular with the society we have agreed to raise their handicaps in the society so they feel they have a competitive chance in the competitions. We have raised Rob Foster and Paul Harlington's handicaps from 6 to 12 in the hope they will play more regularly. Darren is looking into getting some polo shirts designed with the golf society logo on the chest and If You Stroke It, It Will Go In The Hole... on the back of the collar. Not sure how much they will cost yet and you don't need to buy one but from the ten people who attended the meeting everyone said they would buy one to wear when we play. We might get Don Armani to design them or just get a special one for the Don. We have decided the dates and courses for the 2017 season. Darren is booking the courses. The dates & course details will be published as soon as we have them. We received a lot of comments about high handicaps in the society and agree they are becoming very high for certain players, so we have agreed to stop the bottom three players handicaps in each of the five stableford competitions rising by the previous handicap system. In the 2016 Xmas Texas Scramble we had two players who had low handicaps who haven't been playing regularly in the society & that made their team be at a disadvantage in the competition. As we draw one low handicap player, two middle handicap players & one high handicap player in the draw, we will play the 2017 Xmas Texas Scramble with no handicaps. The £5 increase is so we can award the 2017 Garby Clark Trophy winner £100 prize money. The Garby Clark Trophy is the player of the year trophy & in the first six years of the society the winner received a handshake, if he was lucky! The £100 cash prize is to try and encourage more players to play all five events & win the trophy. The £5 increase has been made for four reasons. 1. Each player will get automatic entry into the hole-in-one competition. I will take a pound per player from the total money collected and add to the hole-in-one prize. This will stop us having to collect the £1's at each stableford competition. 2. We are introducing a longest drive competition on each of the stableford competitions. It will always be on the 18th hole, you must hit the fairway for it to count. The prize is three Heppy's Golf Society logo balls. 3. We are introducing a raffle at the end of each stableford competition where we draw players names out in pairs, add up the two stableford scores from the day & the pair with the highest score will win £15 each. If there are an odd number of players, the last person drawn out will have their stableford score doubled. 4. We have been charging £35 for cheaper courses and £40 for the more expensive rounds (Rudding Park & Hull). We will still charge £40 for every stableford competition. The Garby Clark Trophy winner will now win £100 prize money. We are going to purchase some Heppy's Golf Society logo pitch mark repairers and ball markers to award to the five stableford competitions in 2017. We are introducing a longest drive competition on each of the stableford competitions. It will always be on the 18th hole, you must hit the fairway for it to count. 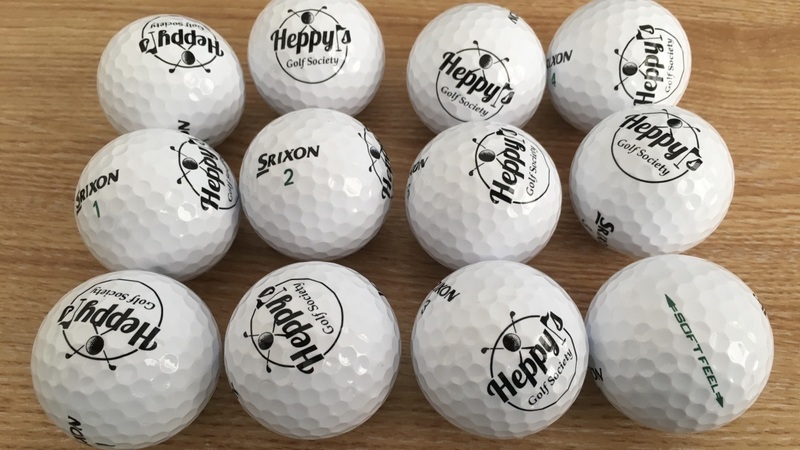 The prize is three heppy's golf society logo balls. A suggestion was made to have a foot-golf event at the Eagles. Nothing has been arranged yet but we will look at having a competition there later in the year. We discussed better ways we can promote the golf society to try an attract some new members. We don't need lots of new golfers but some new keen members are required. We are going to take some group photos from the golf days and put them up in the pub. We will promote the upcoming events better in the pub & using social media. We are going to create some colourful A3 posters and put the on the board as you walk into the pub and other places in the pub so more people notice them. I will create some digital images to send out on Facebook and Twitter. We will need members to share them with their friends/followers on social media.